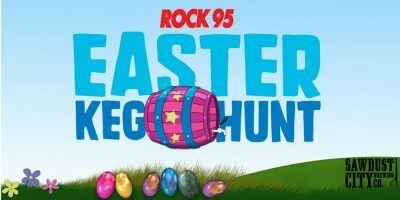 Rock 95 and Sawdust City Brewing Company present: The Rock 95 Easter Keg Hunt. Just find this basket of Easter Kegs hidden somewhere on Rock95.com. When you find it. Click it, and you’ll be entered to win BEER FOR A YEAR. It’s that easy… almost like taking Easter Candy from a baby! With the Rock 95 Easter Keg Hunt, a year of good beer awaits you, courtesy of Sawdust City Brewing Company…Ring in spring with Little Norway Pale Lager and Golden Beach Hazy Pale Ale now at the LCBO. Must be 19 or older, please drink responsibly. Classic Rock. New Rock. Get it all for Easter. Rock 95. This contest is open to all residents of Simcoe County over the age of 19 except employees and immediate families of Central Ontario Broadcasting (C.O.B.) Radio and participating sponsors. By entering a contest, he/she is giving Rock 95 consent to publicize and/or broadcast his/her name, character, likeness, or voice on-air or online. Rock 95 is not responsible for a listener’s inability to register online due to service interruption, technical problems and the failure of electronic equipment or the inability of a listener to contact Rock 95 for any reason whatsoever. Decisions of Rock 95 are final and cannot be challenged. Only one entry per person, if it’s discovered that someone has entered more then once, all entries become null and void. Proper identification is required prior to receiving the prize (valid driver’s license, passport, or other photo ID). The prize is not exchangeable for cash value, no replacement for lost or stolen gift cards will be provided, gift cards can be combined.